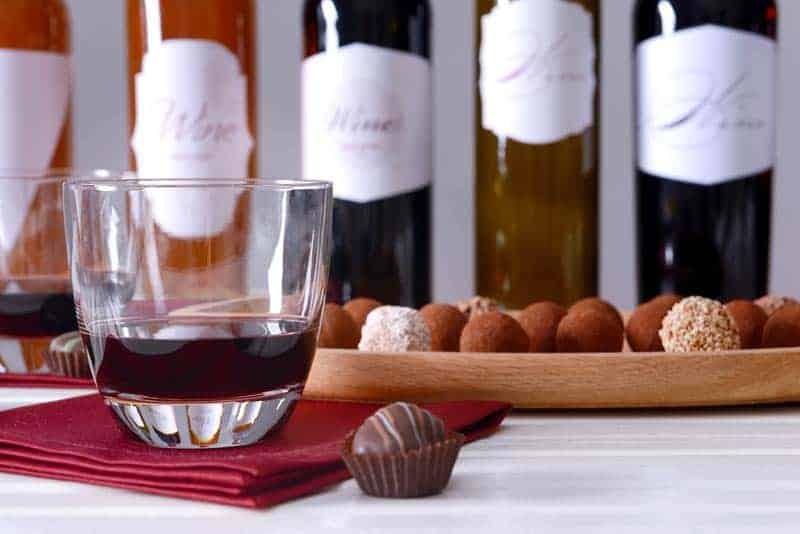 Whether you’re celebrating an anniversary, a holiday or simply having a lovely dinner with your significant other, you can’t miss pairing the best dessert wines with your sweet treats. But how to choose the right ones? More often than not, we put so much care into finding the right pairing between the various dishes of our meals and the wine. But when it comes to the final course, the dessert, most of us are guilty of devoting less effort and limit ourselves to choosing a “dry sparkling wine”. What an awful choice, I must say. And to be honest, I used to hate pairing my desserts with wine, because either the cake or the beverage didn’t do justice to the other. Sticking to coffee seemed a better solution until I had a talk with a sommelier, who revealed all the secrets to choosing the best dessert wine for the final course. Dry sparkling wines are often considered dessert wines. We are all used to drinking a flute of bubbles at the end of a meal. But unless the meal ends with a salty dish, forget about this pairing. There are many wines to consider that pair wonderfully with your sweets. Pairing food and wine is certainly not easy, and things are even trickier when it comes to desserts. In fact, wine pairing is a combination of technical knowledge and creativity. When choosing a wine, one must consider the characteristics of the dish and the properties of the wine, but also the classic pairing guidelines. Pairing food and wine doesn’t have the simple purpose of finding the wine that “fits” with the dish. When choosing the wine you should aim to blend the two elements harmoniously and create new taste sensations. There are two main ways to pair food and wine, either by contrast or by analogy. It is easier to pair by analogy. In other words, the good old rule stating that a sweet should be paired with a sweet wine is the golden rule to follow when choosing the dessert wine. On the other hand, pairing sweets and wine by contrast requires a full assessment of both the dessert and the wine. You should have a strong understanding of how the components of the wine change or alter the taste of the dish. Unless you’re an experienced sommelier or connoisseur, it’s unlikely to have that knowledge and sticking to the golden rule is the wisest thing to do. The Italian Federation of Sommelier Hoteliers Restaurateurs (FISAR) established two methods of wine and food pairing, one for salty foods and one for sweets. The presence of sugar in the dish changes the perception and organoleptic properties of the wine, this is why making this difference is a must. Desserts can be categorized based on the type of dough used for the preparation, type of cooking and fillings. In fact, you can choose from sweets with leavened or unleavened dough, baked or fried, filled with creams, dried or candied fruits, spices, and more. Moreover, there are many fresh desserts to consider, such as fruit salads or ice creams. To make a good pairing, it is important to evaluate the characteristics of the sweet you’re going to serve and choose a wine accordingly. Once again, FISAR has identified the parameters of the evaluation and assigned a numerical value to each element. For a winning match, try to pair desserts with wines of similar value, ranging from 1 to 10. The cooking time and the structure of the dessert should also be considered when choosing the right dessert wine. Remember the golden rule? Sweets pair well with sweet wines. But not all sweet wines are the same. There is a huge difference between a still and a sparkling sweet wine. And then, when should you serve a raisin wine? Or a fortified variety. What are aromatized wines and when to serve them? 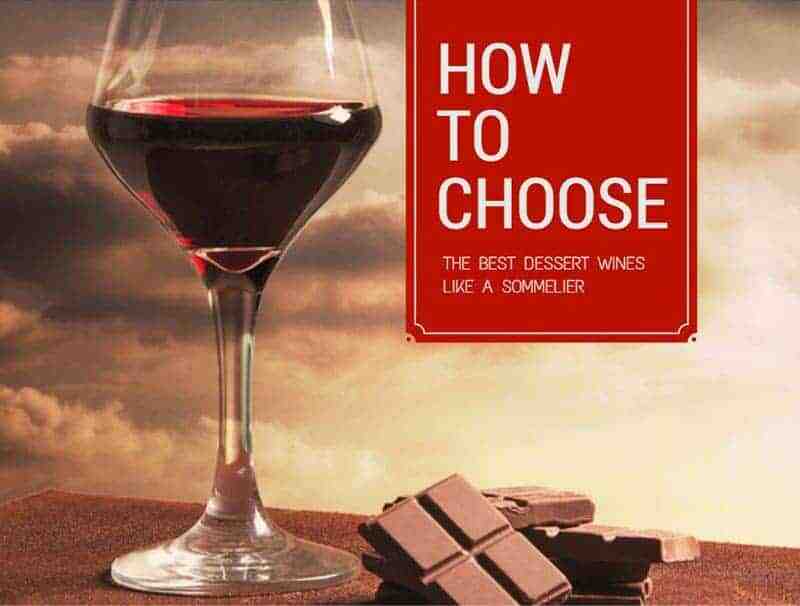 If you want to choose the best dessert wines like a sommelier, you must know the answer to all these questions. Not all still sweet wines go well with desserts, but there are a few you can pair with your sweets. Among them, there are two which deserve to be mentioned, Muscat and Malvasia. Both grape varieties are renowned for their sweetness and they pair wonderfully with many desserts. Since both Muscat and Malvasia wines are produced as dry wines as well, you should pay attention to choosing the right type of wine. Moscato d’Asti is a fine example of still sweet dessert wine famous all over the world for its rich flavor and inebriating fragrance. Both Muscat and Malvasia wines are also produced as sparkling, fortified and raisin wines. Although ending a meal and pairing dessert with sparkling wine is a classic, Champagne and Prosecco are rarely the right choices. Nevertheless, there are many sparkling sweet dessert wines to consider. One of the most famous is Asti Spumante, a sweet wine made from Muscat grape varietal. A noteworthy sparkling dessert wine is also Vernaccia di Serrapetrona, an Italian wine made from dried grapes with a special technique that includes three fermentations. Gran Reserva Cava and Brachetto d’Acqui are two other delicious sparkling dessert wines to consider for your final course. Raisin wines are sometimes referred to as straw wines or Passito, the Italian word describing the production technique. All raisin wines are typically characterized by a sweet flavor derived from the production method. The grapes are left to dry before fermentation to eliminate water. In this way, the sugars and aromas concentrate in each grape, giving the wine a special flavor and strong aromas. There are various ways to dry the grapes before making the wine. The respectable wineries usually dry them directly on the vine, delaying the harvest by about a month compared to the natural ripening of the grapes. The fruits dry in the sun and enhance their sweetness and aromas. The grapes can also be dried after the harvest with the help of a ventilation system that simulates the natural process. Because the grapes are no longer attached to the vine, the results are generally poorer and the raisin wine resulted is less flavored. Another drying technique practiced by many wineries is harvesting the grapes and leave them to dry in the sun for about a month. The grapes are hanged on wires or stored on trellises until dried and this method is often used in respectable wineries. Because of their rich bouquet and sweet flavor, raisin wines pair wonderfully with desserts. Cotes du Jura is a fine example of French raisin wine made from a blend of Chardonnay, Sauvignon and Poulsard grapes. Spain is famous for its Ligeruelo wine which also pairs well with many desserts. But Italy is the most famous for its raisin wines. The most popular is probably Vin Santo produced in Tuscany; other delicious raisin wines to consider are Moscato Passito di Pantelleria and Caluso Passito. Fortified wines are obtained through the classical fermentation technique but at some point of the production, the winemakers add a certain quantity of alcohol, either ethyl alcohol or wine distillates, to “fortify” the wine. Depending on the type of fortified wine that is produced, alcohol can be added either during the fermentation or when the fermentation has ended. In the first case, the high concentration of alcohol will inactivate the action of the yeasts and stop the fermentation process almost instantly. The residual sugar left in the wine as a result of the interrupted fermentation will add up to the sweet flavor of the wine. Madeira and Porto are probably the most famous fortified wines. Another noteworthy wine to pair with your sweet treats is Marsala. However, keep in mind that Marsala is obtained by adding brandy to the wine when the fermentation is over, this is why Marsala is produced as both dry and sweet wine. For a winning wine and dessert pairing, choose Marsala Dolce. Jerez is another fortified wine similar to Sherry. To be considered fortified, a wine must have an alcohol concentration between 15% and 22%. Aromatized wines are obtained from blending one or more wines with liqueurs, herbs, juices and/or spices. There has to be at least 75% of wine in the total volume of the beverage but there is no rule on what aromas or spices to use to flavor the wine. Most of the times, aromatized wines are obtained from a blend of sparkling and still wines fortified with grappa or brandy and sweetened with grape must, sugar, fructose, glucose syrup or honey. Natural dyes are sometimes used to enhance the color of the beverage. Because the addition of alcohol, aromatized wines should have an alcoholic concentration similar to the fortified wines. A famous aromatized wine is Vermouth, which is produced in both dry and sweet varieties. Sweet Vermouths pair well with desserts while the dry varieties are ideal to make delicious wine cocktails. Ignorance or, in our case theory, is bliss. But what wine should you actually pair with your dessert? According to the sommelier’s advice, here is a list of sweets and their best wine pairs. Leavened sweets are often served as desserts and they are popular all over the world. In this category, we can mention sponge cakes, brioches, Savarins, baked doughnuts, and all the other leavened baked desserts. The best wines to pair with these sweets are the soft sparkling wines with low alcoholic concentrations, such as sparkling Riesling. Fried doughnuts, pancakes, churros, and fried pastries pair well with sweet white wines. You should choose a still wine with a very fragrant aroma and a rich and soft flavor, such as Ramandolo or Gewürztraminer wine. Dried sweets are often made of puff pastry or cookie dough and are filled with candied or dry fruits such as nuts and almonds. Biscuits and shortbread sweets are also included in this category. Dried sweets pair well with fortified or aromatized wines. Moscato d’Asti Passito, Vin Santo, Porto, Marsala or Vermouth are all great choices for this type of desserts. Jam or cream fillings: pair well with medium-soft sweet wines such as Muscat, Müller-Thurgau or Riesling wines. Fresh fruit: pies and sponge cakes can often have fresh fruit fillings. Sweet white wines with intense aromas, such as white raisin wines, are the best choice in this case. Make sure the wine’s aroma is fruity and intense. Red fruit fillings: raspberries, strawberries, cranberries and other red fruit fillings pair wonderfully with sweet and very fragrant red wines, such Brachetto d’Acqui. White fruit fillings: apples, pears, bananas and other white fruit fillings should be paired with slightly sparkling sweet white wines such as Rappu di Rogliano. The effervescence and perfume of these wines contrast very well with the filling. Almond biscuits, macaron, marzipan, and other sweets made with almond flour pair well with the flavorful body and intense aromas of white raisin wines. You should choose a raisin wine with a full body and intense structure, such as Albana di Romagna. Choux pastries and éclairs pair well with flavored red wines and fortified wines. If you want to make the dessert stand out, pair your chocolate filled choux pastries with a bottle of Banyuls. If the pastries are filled with vanilla creams or whipped cream, a very sweet and fragrant wine like a semi-dry Marsala will certainly do justice to your dessert choice. Mignon pastries are usually filled with fruits or creams but regardless of the filling, they pair well with very sweet fragrant wines, such as Vin Santo. All soufflés pair well with fortified wines. Lemon, vanilla and candied fruit soufflés find their best buddy in a white fortified wine, such as Marsala Oro or Marsala Ambra. Chocolate and liqueur soufflés benefit from pairing with red fortified wines. Pancakes and crepes are easy to make and loved by everyone. They can be filled with whipped cream or topped with sauces and syrups. Regardless of your choice, the distinctive taste of the dough pairs wonderfully with sweet and not very fragrant wines, such as Alsace Gewürztraminer. For decades, sommeliers advised against ice cream and wine pairings. The cold desserts alter the perception of the wine, therefore their claim has a strong base. Nevertheless, you can make a winning combination if you choose your wine wisely. Sweet Muscat wine pairs well with vanilla or hazelnut ice cream. Raisin wines enhance the flavor of pistachio, chocolate and strawberry ice creams or sorbets. Tokaji wines and ice wines pair perfectly with eggnog and almond ice creams. Desserts such as crème caramel, crème Brulee, or Bavarian cream pair well with fresh white wines such as Muscat de Rivesaltes. Choosing the best dessert wines for your final course is not rocket science but it's an important thing to learn if you want to impress your guests. Therefore, forget about pairing that dry Prosecco you saved for special occasions with your delicious chocolate cake. 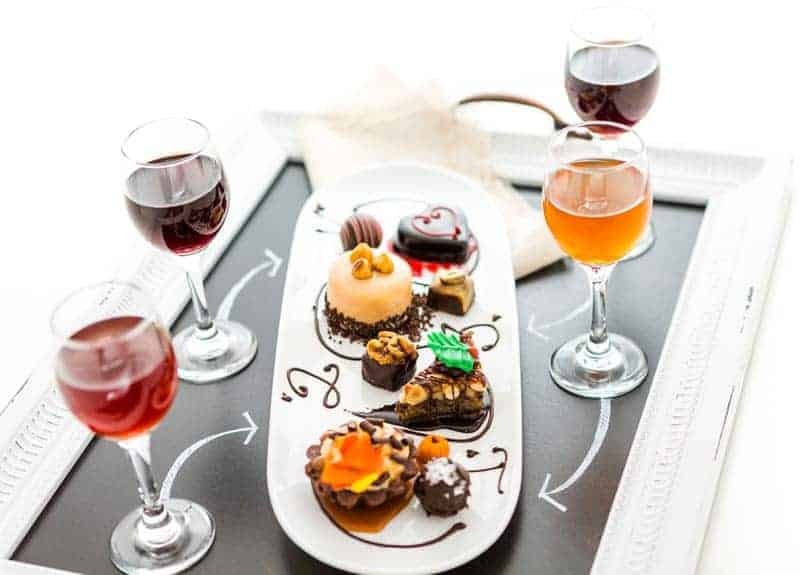 Instead, use the guide above and pair your sweets with the best dessert wines that are able to enhance their flavor and end your meal with success. After all, it’s better to stick to coffee instead of serving your sweets with an unsuitable wine. Bon appetite! What Wines Go With Pizza? 10 Picks of Amazing Pairings.